This was a center of Christian worship for more than 1,000 years ago, when monks of the Celtic Church had a monastery here. Their timber or wattle buildings were swept away when Robert the Consul, Norman earl of Gloucester, granted the land to Cistercian monks from the French abbey of Chirvaux for the founding of a daughter house. 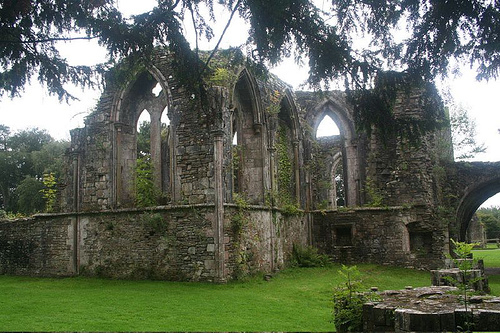 The abbey took 40 years to build and was the largest and wealthiest in Wales in the 12th century. The exterior was extensively altered during renovations last century, but the deeply recessed doorway, flanked by banded shafts carrying carved capitals, belongs to the late Norman period around 1175-80. So do the three round-headed windows above. The present parish church was formerly the monastic nave. Inside the church, the massive piers which divide the building into six bays have the simplicity and dignity of Norman work at its best. Those with an eye for detail may spot the bar-holes either side of the doorway, which enabled a stout oak beam to be thrust home to keep out intruders. The church was originally 272 ft long but is now only 115 ft, two bays at the east end having been cut off at the time of the Dissolution of the Monasteries in the 16th century. The south aisle contains tombs of the Mansels, the family who acquired Margam in the 16th century, and the west windows are the work of William Morris, Victorian artist, writer, and visionary. The nearby Margam Stones Museum contains superbly sculptured wheel-crosses belonging to the early Christian period. The great cross of Cynfelyn, with its heavy base, is the most elaborate and may have commemorated an event rather than a person. Other stones include a Roman milestone which was turned into a Christian memorial and two 6th-century pillar stones, one of which is notable for its inscriptions in Ogham, an Irish influence which was felt in Wales at this time.